Your wedding is just around the corner and you need a guestbook but not a traditional blasé guestbook. You want it to be as special as you and your loved one. So what are the other options? Here are some creative alternatives to the traditional guestbook that may just strike your fancy. This is a fun game that now comes in all sorts of sizes. Your guests can each sign a block with permanent marker. When you pull out the game for future fun, you will check a chuckle and a walk down memory lane reading all the words of advice and well wishes on your blocks. This is great idea for big game night enthusiasts. You have can have colored ink pads set up by a picture, drawing or painting of a bare tree. Each guest adds their fingerprint to the tree and signs their name in it. The downside to this is that there is no room for anything other than the guests name or signature, which let’s be honest, defeats the purpose altogether, however it is some couples wants. For those who are puzzle lovers this is a wonderful way to capture your guests’ well wishes. You can have the puzzle blank or plain wood but the end result is your monogram, letter, or date. Each guest signs a puzzle piece and it symbolizes that everyone coming together for the lovely couple. If you have a photo boot set up with props and such, have someone there to take your guests photos with a vintage Polaroid camera. Once developed the guests can sign under their picture and still have room to write well wishes to the couple. The down side? People may not want to wait for their Polaroid, will forget to sign it, or some people just don’t like getting their photo taken. Either way this is becoming a huge hit and more of a trend in weddings today. Yes, have your guests sign a globe. This is especially darling if you have a destination wedding or the couple is from different countries. It is something you can display in your home and be forever present for you to look at whenever you wish. For those who do not want to stray too far from a traditional guestbook but would like a creative twist, Adlibs and predesigned paper entries are becoming more popular in wedding trends these days. Adlibs are a hilarious way to get your guest involved and yet leave touching words of marriage wisdom and well wishes. Predesigned page entries change things up with different sections with different topics, which if passed around at the reception gives guests time to sit and fill out instead of feeling rushed leaving a generic message. There are tons of creative ideas out there but these are some of the top choices that are coming about in today’s wedding trends. 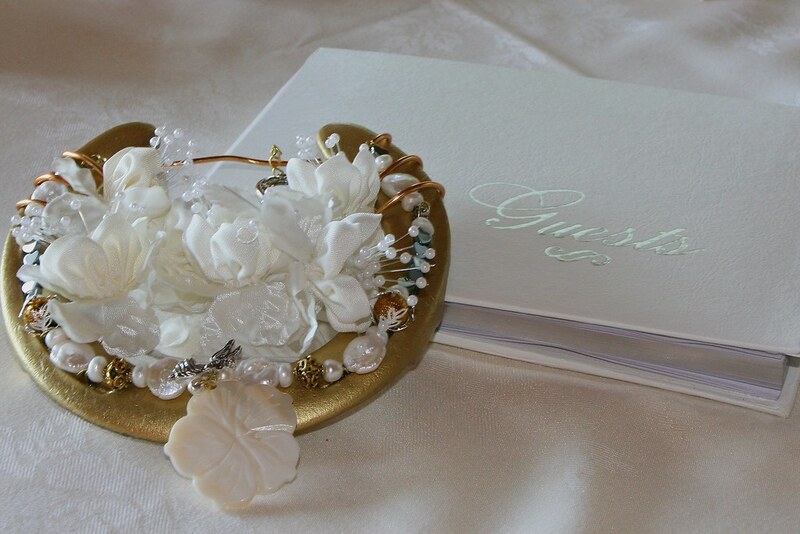 Let your creative juices flow when deciding or creating your guestbook. Let it speak about you and your spouse and be something you will have fun looking through or putting on display instead of it collecting dust on shelf. This article was written by Catriona McBain, a current student at the University of Central Florida pursuing an degree in English and a professional writer for Cloverlawn Butterflies.